-Administering Medications: Pharmacology for Healthcare Professionals is designed to teach the safe administration of medications to healthcare students. 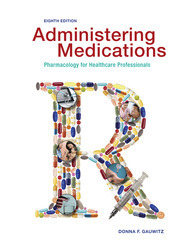 -The text's many features help break down the various aspects of drug administration, allowing the student to gain a full understanding of when and how to administer medications. 50 most frequently prescribed drugs are boldfaced in the Representative Drug table at the end of most chapters.